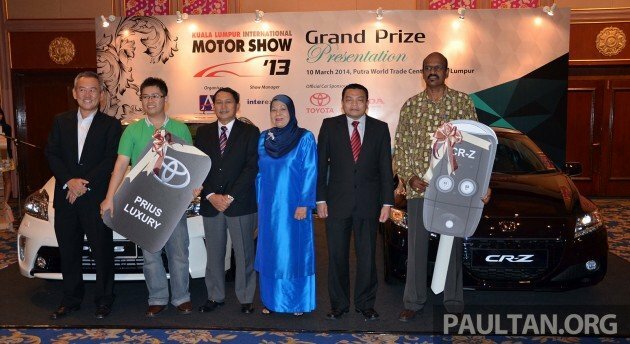 Honda Malaysia and UMW Toyota Motor handed over the keys of a Honda CR-Z and a Toyota Prius 1.8L Luxury respectively to the winners of the Kuala Lumpur International Motor Show 2013 (KLIMS13) lucky draw grand prize at PWTC this afternoon. The hybrid car grand prizes are in line with the show’s theme of “Efficiency In Motion”. The lucky duo are Lee Min Fong from Teluk Intan, Perak (Prius) and Poopaladurai A/L Selvadurai from Melaka (CR-Z). Their names were drawn from a pool of 302,715 visitors who made their way to PWTC over 10 days in November 2013. The draw was conducted by Malaysian Automotive Association president Datuk Aishah Ahmad at the KLIMS13 Gala Dinner on November 29, 2013 in the presence of exhibitors and press. Paultan.org was an official media partner of KLIMS13, and we brought to you live coverage of our home motor show like how we do it in Geneva, Paris, Tokyo, Detroit, Shanghai, Bangkok and Jakarta. KL is not big enough for a major world debut, but there were plenty of new metal and beautiful ladies at the show, so check out our KLIMS13 story archive to refresh your memory. Till next time! if i were either one of them, i’ll sell the cars off and buy a better one of my choice. Still kinda sad about the missing MH370. how about the beetle from maybank? still no winner? the beetle has flown away. Same also with MotoGP Sepang Contest 2013, the prize is Benelli Bike but the Sepang said he contest was cancelled due to some problem. Sepang cheat the spectator in order to increase the sale of tickets.